Annually we venture to new parts of Morocco in search of future tour locations for our Morocco photography workshops. 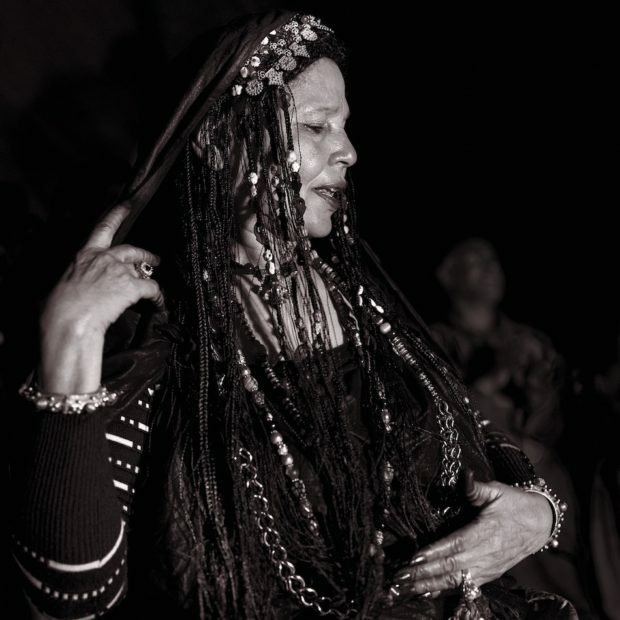 This year it was to Goulmine in Morocco’s south west where we wanted to see and indeed booked a Guedra performance. Guedra is a form of dance, a ritual usually found in the southern desert towns of Goulmine and Tan Tan. For followers of Led Zeppelin, their hard rock classic Kashmir was penned near Tan Tan. Guedra is an evening time custom, normally held around a fire with a group of men up to 10 providing the rhythm using hands and drums and the Guedra a female dancer staging different evocations of a ritualised performance. Guedra dance is about the hands and fingers. Possibly a sorrowful face is also in keeping. Wearing black and ornate jewellery the Guedra’s hands and fingers are kept under wraps until she feels the time is correct, then with hand-to-head motions, she salutes the four corners: north, south, east and west, to represent the elements fire (the sun), earth, wind and water. The Guedra uses fingers to communicate, the lines to the spirit and energy fields, she touches her stomach, heart and head, at that point rapidly flicks her fingers towards all others introduce, in life or soul, sending gifts to them from the profundities of her spirit’s vitality. The men are joyful and provide a high octane atmosphere. More images of the Guedra and Goulmine can be found here. The photos initially in colour were cropped to square format and were shot at high ISO’s of up to 6400 and with wide angle lenses. Our Morocco photography workshops can be booked all year round and include tours to Fez, Meknes and Chefchaouen. We also run landscape tours to Andalusia in Spain focusing on photographing forest, rivers and coastline.